There’s plenty of positive economic momentum for the metro Denver region, economist Patty Silverstein told more than 300 business leaders at State of Small Business this morning. On track to add more than 40,000 new jobs to the area, a low unemployment rate, a diverse economy and nearly 1 million positions filled by sole proprietors are among some of the keys indicators of that success, she said. In fact, Colorado ranks fourth for concentration of sole proprietors: “Needless to say that is a huge force in Colorado,” said Silverstein, president and chief economist of Development Research Partners. The event was hosted by the Denver Metro Chamber of Commerce and the Denver Metro Small Business Development Center in partnership with the Daniels Fund Ethics Initiative at the University of Colorado Denver Business School. With growth comes challenges, Silverstein said, noting the cost of housing, the challenge of finding workers in a competitive economy and broader forces, like tariffs and a growing national debt. Locally, she noted that wages are rising and home prices are moderating. Another force creating change? Technology. And, Silverstein said that was no surprise given that the metro area ranks eighth for employment concentration of IT-software industry workers. That speed of change that technology brings can often create fear – particularly about questions of whether jobs will go away, said Chamber President and CEO Kelly Brough. But, she pointed out that even as technology removes some tasks, or even some jobs, World Economic Forum estimates that 133 million new roles may emerge globally by 2022 – and that’s nearly double the jobs that could be eliminated by technologies like automation. Three small business leaders shared how they are making use of these technologies and helping other businesses take advantage of them. “If we can get one or two tasks off their plate that’s going to free them up … we see that as the first phase in this movement,” said Frank Trevino, who leads artificial intelligence and digital transformation strategy and engagement for Tinman Kinetics. At Tinman, they work with small businesses to take advantage of technology that can help them get better data and connect more with their customers, but he cautions against “shiny object syndrome,” using technology for technology’s sake. While the use of more technology in business can lead to several “micro-disruptions,” once a team is using more automation it makes their work – and their focus on strategic initiatives in your business – that much more critical said Bill Sinclair, chief technology officer and interim president and CEO of SALT. That “tribal knowledge,” must be archived: “We have to make sure they’re capturing that knowledge, otherwise it could cause massive disruption to our business,” he said. While Mark Spiecker is pioneering one of the first pharmacies in the country that will fill and compound prescription drugs only with robotics, how he approaches his business – from finding partners to train and build the workforce he needs to focusing on relationships to build his business – won’t change. “It’s really those ethics of how we operate and how we do business that’s critical to our future success,” said Spiecker, president of STAQ Pharma. 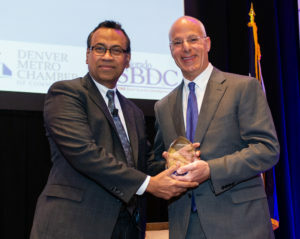 For the fourth year, the Daniels Fund Ethics Initiative at the University of Colorado Denver Business School, in partnership with the Chamber and the Denver Metro SBDC, awarded the Bill Daniels Ethical Leader of the Year. Greg Anton, chairman and CEO of ACM, was recognized as this year’s honoree. The award is named in honor of Daniels, the cable television pioneer, and the ethical principles he stood for: integrity, trust, accountability, fairness, respect, transparency, viability and rule of law. “Greg and his business partners embody these values right from the top,” said University of Colorado Denver Business School Dean Rohan Christie-David.